He understood how Vladimir Putin’s regime worked and still was brave enough to oppose it. He was an outspoken critic of the Kremlin, and never hesitated to make sharp statements against the direction Russia was going. He publicly denounced Russia’s war in Ukraine, and went to the European Parliament to call for the imposition of ‘Magnitsky sanctions’ against regime officials. 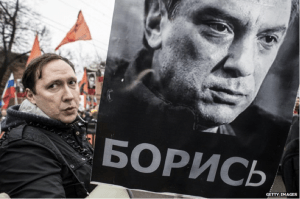 A former Deputy Prime Minister, who Boris Yeltsin almost named as his successor, a man committed to liberal values, freedom of expression and human rights, Boris Nemtsov has paid the ultimate price for his bravery. Nemtsov’s murder is the highest profile killing during Putin’s fifteen years of rule. That the leading voice of opposition could be gunned down in public, two hundred metres from the Kremlin, under CCTV cameras that happened not to be working, can hardly be perceived as a coincidence. Like all opposition leaders, Nemtsov was under constant surveillance by the Russian security services. It is hard not to conclude that no matter who pulled the trigger, they were allowed to do so. During Putin’s rule, several symbolic figures have been sacrificed to intimidate other potential dissidents. In 2003, Mikhail Khodorkovsky, the outspoken owner of the Yukos oil company and the bank Menatep, was arrested and jailed for ten years. His imprisonment brought the oligarchic class to heel and consolidated Putin’s ‘vertical’ of power. In 2006, Anna Politkovskaya, a prominent reporter of the Russian Army’s abuses in Chechnya, was shot dead, apparently as a warning to other journalists. One month later, Alexander Litvinenko’s death proved that no one is beyond the reach of the regime. The former FSB officer, who became an outspoken critic of Putin, was poisoned by radioactive polonium in London. In 2009, Sergei Magnitsky, a lawyer who accused Russian officials of large-scale theft and tax fraud, died in prison after being denied medical care. Thus the most vocal critics of the Kremlin have often ended up silenced. Semi-official theories about Nemtsov’s murder have pinned the blame on everyone from Islamist militants, to Ukrainians, to CIA agents, to liberal provocateurs, to Nemtsov’s lover, the 23-year old Ukrainian model Anna Duritskaya. Vladimir Putin’s spokesman, Dimitry Peskov, implied that the state had no reason to want Nemtsov dead when he commented that “Boris Nemtsov was only slightly more than an average citizen”. It is true that Nemtsov was not immensely popular as a politician. His role in Yeltsin’s governments in the 1990s led many Russians to regard him unfavourably. He lost his seat in the Duma in 2003, and came a distant second in the Sochi mayoral elections in 2009. He certainly did not have the profile of the anti-corruption activist Alexey Navalny, released from jail last Friday after serving a fifteen-day sentence for distributing leaflets. However, with the rouble crisis, a shrinking economy, oil prices down 50% and rising unemployment, a leader like Nemtsov could have become a real threat for Putin’s regime. He had been a longstanding irritant for the Kremlin, producing reports for several years detailing government corruption and incompetence, but it was the Ukrainian crisis that returned him to national prominence. A supporter of the Orange Revolution in 2004 and a former adviser to president Viktor Yushchenko, Nemtsov had been among the first to criticise Putin’s annexation of the Crimea. Last year he produced two films which highlighted Russia’s military involvement in Ukraine and suggested Russian rebels may have been responsible for downing Malaysian Airlines flight MH17. At the time of his death, he was preparing to publish a report based on interviews with relatives of Russian soldiers who had been killed fighting in Ukraine, which would have further undermined Putin’s assertions that no army units were on Ukrainian soil. Not for nothing did Ukrainian president Petro Poroshenko describe him as “the bridge between Ukraine and Russia”. Just weeks ago, Nemtsov said in an interview: “I am afraid Putin will kill me”. Even though he knew he was in danger, he continued to condemn the Russian president’s aggressive domestic and foreign policies, and the principle of ‘managed democracy’ by which the state exercises control over television channels and the press. It is Putin’s media that is behind the intolerant and paranoid public mood in Russia today, which portrays opposition leaders as evil forces, foreign agents and traitors. The responsibility for the atmosphere of murderous hatred in which Boris Nemtsov was killed lies squarely with Vladimir Putin. Five men are now in police custody, suspected of Nemtsov’s murder. But this will not bring about an end to speculation over who pulled the trigger, and who gave the order. Few of his supporters expect the full truth to come to light. With Boris Nemtsov died another piece of hope that Russia might become a liberal country without totalitarian features, a democratic country without adjectives, and a place where individuals will be able to express their thoughts without being afraid that they will be the next victims of the regime. Natia Seskuria is completing her Master’s degree in Politics, Security and Integration at SSEES. Her thesis focuses on the Russian-Georgian War of 2008. Follow her on Twitter @natia_seskuria. The veto was immediate: European football’s governing body UEFA will not allow Dinamo Kiev to wear the slogan ‘Geroiam Slava’ (Glory to Our Heroes) in place of their usual sponsor’s logo for matches in the Europa League. UEFA, they explained, does not allow political slogans of any kind in its competitions. Dinamo’s gesture was intended to commemorate the victims of the Maidan protests, and the Ukrainian soldiers who have died fighting in the Donbass. They also wanted to return international attention to Russia’s involvement in the conflict. 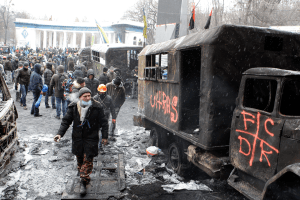 But despite UEFA’s attempts to keep the game apolitical, football and politics are deeply intertwined in the events that have taken place in Ukraine since Euromaidan in the winter of 2013/14. This connection predates the revolution. Oligarchs, who own the majority of the clubs, have used football in connection with large media empires in order to create strong political profiles, a process that was copied from the former Italian Prime Minister Silvio Berlusconi, and has fittingly been termed the Berlusconization of Ukrainian football. While the clubs, and their ownership structures, represent the upper echelons of Ukrainian society, fans have also had a major impact on recent political events in Ukraine. Organized fan groups called ultras were influential in the events that took place on the Maidan in Kiev. Ultras from across all major clubs formed defence units to protect protestors from thugs hired by President Viktor Yanukovych, and were therefore instrumental in removing Yanukovych and his cronies from government. In addition, as the Twitter account by the Ukrainian blogger Oleksandr Sereda indicates, many of the ultra groups have now taken an active role in the conflict that is taking place in the Donbass by forming irregular units to fight the Russian-backed separatists. The Ukrainian ultras are not alone in their fight. Across the Black Sea, in Georgia, Torpedo Kutaisi fans held up a banner last weekend to honour the deaths of Georgian irregulars who have fought and died in the Donbass. A war for Ukraine’s independence, in the eyes of Torpedo fans, is also as a war for Georgia’s independence. This all serves to underline the complexity of the military situation in the Donbass. While Russian mercenaries, and regular military units, are supporting the rebels, the Ukrainian army has itself made use of foreign mercenaries and irregular units. While the separatists have rightly been accused of ceasefire violations, the composition of the government’s forces makes it difficult for Petro Poroshenko’s administration to guarantee the ceasefire on their own side. Any peace process could indeed be complicated, as it will not be easy to force the various groups involved on both sides, many of which have become extremely radicalized since the conflict began, to lay down their weapons. Ukrainian Premier League: the show must go on? Despite the continued fighting in the Donbass, football is supposed to return for the second half of the Ukrainian Premier League. While it is hard to imagine how sport can continue in a war-stricken country, officials have argued that only a small part of the country is truly affected by the fighting. At the same time, however, Donbass is home to five of the 14 clubs in the Ukrainian Premier League. These clubs—Shakhtar Donetsk, Olimpik Donetsk, Metalurh Donetsk, Zorya Luhansk, and Illichevets Mariupol—have now been forced to play their games in exile. Under these difficult financial and psychological circumstances, the club has now decided to withdraw from the Ukrainian Pervaia Liga (second division), as the Alchevsk steel works has been taken offline due to the war. Arsenal Kiev stand ready to purchase Stal Alchevsk’s licence, and with it their place in the league, which may effectively mean Stal Alchevsk ceases to exist as a club. The episode has brought renewed uncertainty to the future of Ukrainian football, as more clubs from the region may be forced to discontinue their participation in professional football. The Ukrainian Premier League had struggled to field a full list of teams even prior to this troubled season, and as a result the league had been downsized from 16 to 14 teams. Last week legendary ex-striker Andriy Shevchenko appealed to the authorities not to suspend the league altogether. But the very fact that he had to speak out suggests that this option is now very much on the table. Shakhtar Donetsk: the fall of a giant? While the future of the Ukrainian Premier Liga remains in question, Ukraine’s most successful team in recent years, Shakhtar Donetsk, is preparing to play Germany’s biggest club, Bayern Munich, for a place in the UEFA Champions League quarter-finals. The first leg on February 17 was held over a thousand kilometres from Shakhtar’s home, in Lviv (closer to Munich than to Donetsk). Against expectations, Shakhtar held Bayern to a 0-0 draw, giving themselves a fighting chance of progressing to the next round. But the second leg in Munich is still to come, and Bayern, having won thirteen and drawn one of their fourteen home fixtures so far this season, are overwhelming favourites. Defeat would be another major blow for Shakhtar’s owner Rinat Akhmetov. Before the conflict in the Donbass, Akhmetov was the richest man in the former Soviet Union. Often considered the pivot of the so-called ‘Donetsk clan’, a loose political alliance of Donbass oligarchs, Akhmetov was also regarded as the financial backbone of the Partiia Regionov, the political party of former president Viktor Yanukovych. The events at Euromaidan and the war, however, would mean that a tie against the Germans could be the last match for a while on the international stage for both Shakhtar and Akhmetov. Being based in Lviv has taken a toll on the team’s performances. Shakhtar are currently second in the table, five points behind their arch-rival Dinamo Kiev and only three points ahead of Dnipro Dnipropetrovsk. With only the top two teams qualifying for Champions League football, Shakhtar’s participation in next year’s competition is very much in doubt. It is not only in football that Akhmetov is feeling the pressure. The conflict in the Donbass has seen many of his assets destroyed in the fighting. He is also facing an investigation over his alleged financing of separatist forces. There is political pressure too: Ihor Kolomoyskyi, another oligarch long regarded as a counterweight to Akhmetov, has emerged as one of Ukraine’s most powerful men and now seems able to dictate the country’s political and economic direction. Kolomoyskyi is the owner of Dnipro and, since March 2014, governor of the Dnipropetrovsk oblast. He has also announced his intention to run for the presidency of the Football Federation of Ukraine (FFU), replacing Anatoliy Konkov, widely seen as Akhmetov’s man. The reshuffling at the top of the FFU reflects the political reorganizations elsewhere in the country. With all these examples in mind, it is hard to believe that UEFA’s attempt to keep football apolitical will truly amount to much. While political slogans should indeed have no place in football, realistically fans and clubs have always found ways to introduce them into the game. Dinamo Kiev have already announced plans to wear their ‘Geroiam Slava’ shirts for matches in the Ukrainian Premier Liga. With fans fighting in the Donbass, clubs being forced into exile due to the conflict, and oligarchs using football as a vehicle to assert political control, football and politics in Ukraine, as elsewhere in the post-Soviet space, have long been conjoined twins. Manuel Veth is a final-year PhD candidate at King’s College London. His thesis is titled: “Selling the People’s Game: Football’s transition from Communism to Capitalism in the Soviet Union and its Successor States”. Follow his research and writing at Futbolgrad.com.